Now, the Washington State University soil scientist’s achievements have earned him a prestigious accolade from the Soil Science Society of America: The Don and Betty Kirkham Soil Physics Award. 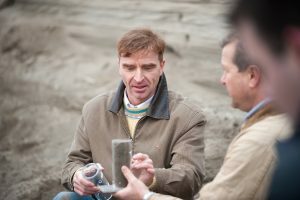 Based at the WSU Puyallup Research and Extension Center, Flury studies the physics of soil and water in the vadose zone — the region between the ground’s surface and the water table. Working in the lab and at field sites including Washington’s Hanford nuclear reservation, Flury discovered that water and water-borne contaminants move faster than previously thought using pores and channels in the ground. His research into this process, dubbed preferential flow, helped lead to tighter chemical restrictions in the European Union. The Kirkham Award, which includes a bronze medal and a $2,000 prize, recognizes soil physics achievements by scientists in the midpoint of their careers. Flury received the award during the society’s annual meeting, Oct. 24 in Tampa, Fla. The honor is named for Don Kirkham, a distinguished soil physicist regarded as the founder of mathematical soil physics, and his wife Elizabeth. Encouraged by the award, Flury hopes to pay it forward through mentorship of students and visiting scientists. Learn about the Soil Science Society of America at https://www.soils.org/.